Just two lights without reflectors set at 180 degrees to each other, and almost no post-processing is required. 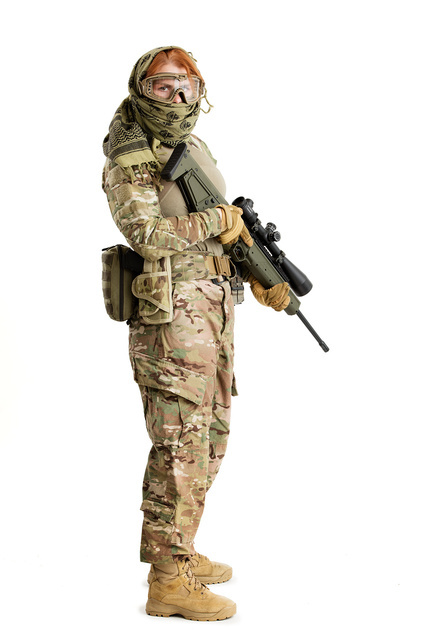 Kel-Tec RDB-C in 6.5 Grendel, Meopta 6-24x scope, ESS goggles. This entry was posted in rifle, weapon and tagged 6.5Grendel, bullpup, Multicam, optics, scope. Bookmark the permalink. Nice. Doesn’t look like point sources – soft boxes? Bare bulbs, both facing away from the model. 180 degrees where? The fanny pack looks to be in relative shadow, so unless the right light is brighter, lights at 3 o’clock and 9 o’clock doesn’t seem to fit. Maybe one light at 4 o’clock and one at 10? Main around 5 o’clock, fill at 1/4 power around 11. I like the effect. Gonna have to try it. Seemless white background? And what was your f-stop set to? Somewhat crinkled seamless paper, f14. I find that 50MP camera requires about a stop smaller aperture than 21MP for a similar level of detail at 1:1 review (since the effective magnification is greater).